Personalized gifts are an ideal way to celebrate a special occasion or mark a milestone in the journey of life. The tradition of engraved jewelry is the perfect way to show you care. 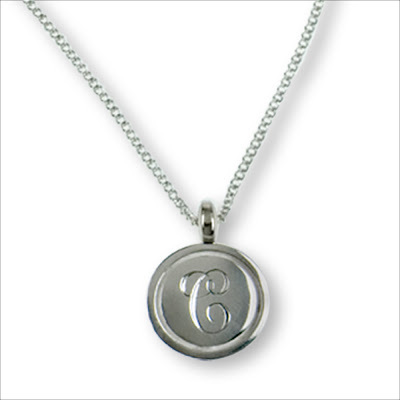 My most popular gift items are vintage style sterling silver pendants, charms and earrings suitable for engraving with a loved one’s initials or interlocking monogram. 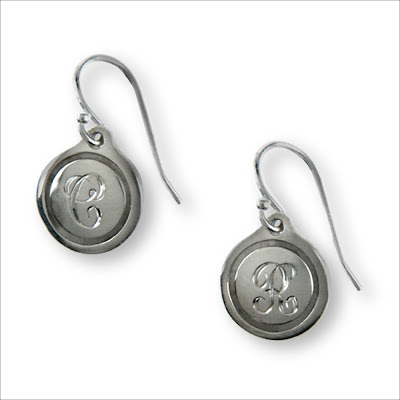 Each piece, like the initial earrings and pendant, pictured above, is engraved to order in my fave vintage script font by skilled artisans who practice a dying craft. Although most personalized jewelry is now engraved by machine, engraving by hand produces a unique design each time, ensuring that no two engravings will ever be exactly alike. It costs a bit more, but it's a worthwhile investment, for an heirloom quality keepsake. Beautifully engraved monograms were a passion of the Victorians, who popularized the three letter monogram, and created the rules regarding placement of the initials. Victorian convention ruled that the bride and groom’s last initial be placed in the center with the grooms first initial on the left and the bride’s first initial on the right. Today, placement of the initials is according to preference. When designing a monogram for an individual, the last initial is placed center with the first initial to the left and the middle initial to the right. If the individual is a married woman, she may choose to place the initial for her maiden name to the right instead. 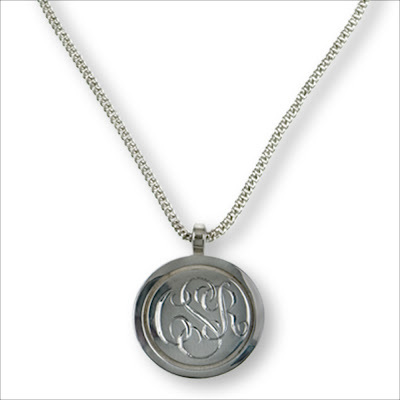 Each vintage style interlocking monogram, like the medallion pictured above, is a unique design that the engraver must first create, according the particular combination of letter shapes. Alas, there is no substitute for the human aesthetic, when it comes to creating a one of a kind monogram. Cynthia Rybakoff sterling silver hand engraved initial earrings, $195.00; sterling silver hand engraved initial pendant, $150.00; sterling silver hand engraved monogram medallion, $295.00, all made to order by request at CynthiaRybakoff.com. I am still swooning from part one of Masterpiece Classic's new adaptation of Emily Brontë's brutal and passionate story of uncivilized emotion run amuck on the solitary windswept moors, Wuthering Heights. Fortunately I can watch it again and again at pbs.org. I awoke this morning with the operatic voice of Kate Bush in my head, and had to watch her 1978 “Wuthering Heights” video on YouTube, an odd geisha style ballet pantomime of the story, which satisfied my craving for more of the turbulent and ultimately thwarted love affair of high-spirited Cathy Earnshaw and her dark brooding Heathcliff. I imagine myself a modern day Cathy coming home at last, dressed for blustery weather and grey skies on the Yorkshire moors in a flowing empire waist ecru linen dress with a cropped fitted wool jacket in periwinkle blue, my long raven hair untamed by pins or clips, my neck adorned with a neoclassic cameo pendant in sage green and white jasper ware on a modern biker curb chain dipped in shiny 24k gold. 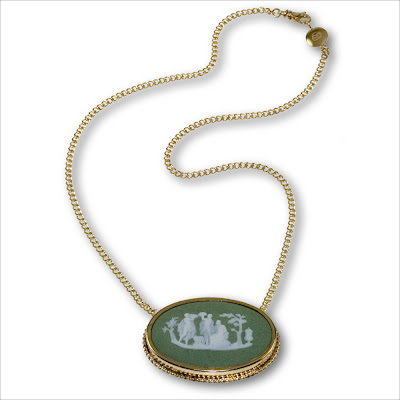 Cynthia Rybakoff vintage green cameo pendant in modern 24k vermeil setting, edition 1/1, $575, by request at CynthiaRybakoff.com. It seems that pink is having another Spring moment, as it does every few years or so in the not so unrelated worlds of fashion and design. For Valentine's day, I've created a botanical photo illustration in geranium pink on smooth bright white stock and paired it with a grey textured envelope. 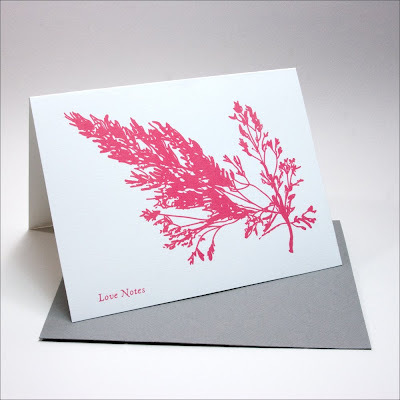 Love Notes, a blank note card, is part of our Handmade On Peconic Bay paper collection I design and produce with my husband Matt Shapoff, who is a photographer and printmaker. Our flagship store is a humble Etsy shop, where we sell my art print cards and Matt's Cyanotype prints and cards. Handmade On Peconic Bay paper goods are also sold at The Parrish Art Musuem gift shop, and will be available on Supermarket in the near future. Be sure to check out Matt's stunning "Peconic Curiosities" series on CynthiaRybakoff.com, which is currently available wholesale only. If you have a shop and are interested in picking up the collection, contact me via Etsy or my website. Handmade On Peconic Bay "Love Notes" Valentine's card, $3.50 on etsy.com. Just spotted on Fashion Week Daily's Chic Report, my deep purple amethyst drops and chunky silver chain with royal purple double faced satin ribbon ties. It's official, purple is still relevant in 2009, after seriously trending for almost a year. Grace at design*sponge, one of my fave design blogs, noticed the purple mini-trend last March in a wide range of products for Spring/Summer 2008. Purple was still running ultra cool for Fall/Winter 2008, when I debuted a color palette of royal purple, hunter green and cool grey gemstones for my sterling silver jewelry collection. Cassandra at coco+kelley, whose color IQ rates at the genius level, and whom I recently discovered thanks to the forward thinking editors at Lucky, is also pondering the evolution of purple for 2009. Her prediction? Paler shades of lavender and lilac will replace the gemmy purples and juicy plums of 2008. I couldn't agree more, as I put the finishing touches on my new collection, which will launch in February. 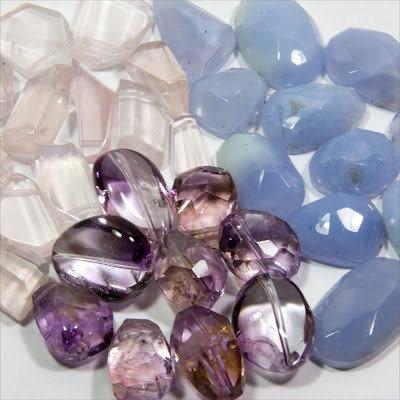 The deep amethyst gems I showed for Fall/Winter 2008 will carry over into Spring 2009, accompanied by a tonal palette of rose quartz, light amethyst, and blue chalcedony. Cynthia Rybakoff sterling silver and amethyst chain link earrings, $300; sterling silver handmade chain with purple ribbon ties, $1,380, both by request at CynthiaRybakoff.com. So far 2009 has me feeling blue. A muted grey-ish blue, more like the color of an overcast sky. My color forecast for Spring is infused with moody colors - faded cornfower, stormy grey, dusty violet, aging ballet pink, polar white. It's a soft and quiet mood, perhaps a reflection of a more global feeling of anticipation and the need to be surrounded by soothing things. I'll be wearing a lot of jewelry, scarves and handbags in these colors for the next few months against a backdrop of black denim, grey cashmere and tweed with a tropical punch of color here and there, like geranium, lime and mimosa. Above is a palette of stones from my Spring 2009 jewelry collection, arranged by color family. 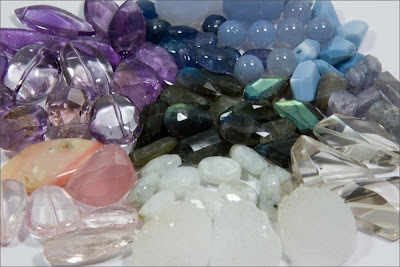 There are pale pinks (morganite or pink aquamarine, rose quartz and pink Peruvian opal), translucent purples (ametrine and amethyst), violet-blues (iolite, chalcedony, blue opal, Umba sapphire), iridescent greys (labradorite) and icy whites (moonstone, rock crystal and snowy rock crystal druzy). I started my career as a painter, at the age of seven and attained degrees in fine art and art history before dropping everything to design jewelry for a living. Along the way, I took a color theory class based on the work of Joseph Albers, the Bauhaus artist and professor who wrote a seminal book called " Interaction of Color", which changed my point of view forever. I have become savant like in the pursuit of a color story for my own jewelry and graphic design work and for the creative direction I do for other companies. 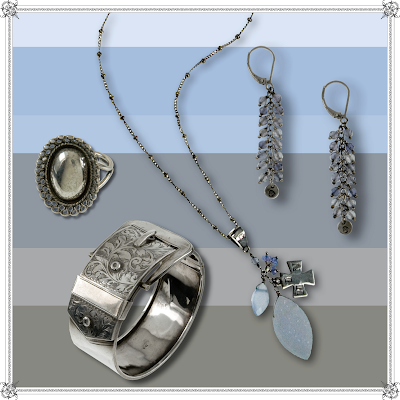 The reigning precious metal color of choice for the new mood is sterling silver. The more aged the patina, the better. If I'm not using vintage silver findings, which i never NEVER polish, I'll do a light oxidation treatment on new silver to give it a darker tone and worn feeling. I am also playing with the idea of tension between the romance and feminity of the stone colors and the hard edged masculinity of darkened silver, and have added some lovely soft ribbon details to soften the mix. 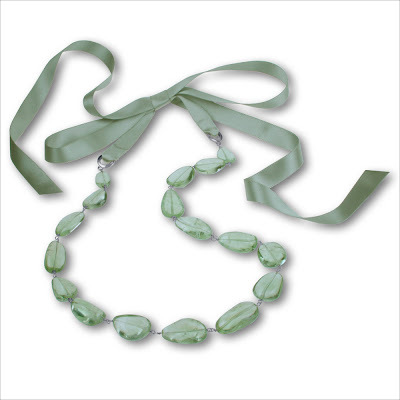 The mint satin ribbon tie necklace above is made from organic tumbled green quartz stones with sterling silver accents. Cynthia Rybakoff sterling silver and green quartz 24" necklace with mint ribbon ties, $700, by request at CynthiaRybakoff.com. My maternal grandmother had humble roots on the Lower East Side of Manhattan. She met a young handsome blond sailor from Romania, who had come to America for a better life and to fight for our side in WWI. After the war, he gave my grandmother a lovely black onyx cameo engagement ring, with a plain bezel and hand engraved ornament on the band. It’s hallmarked “14K” , indicating American, not European origin, and inscribed “S.H.F 2/2 1917”. I was given the ring after my grandmother’s death, and to this day wear it as a right hand ring endowed with a little piece of my own fashion history. Recently, I started collecting vintage cameos in a variety of materials, especially colorful English Jasperware and Italian coral and shell. Collecting isn’t really the right word. I am obsessed with cameo jewelry. Cameos add a graphic punch of color and design, plus a bit of much needed romance, to my modern classic wardrobe which leans piously towards subdued tonal palettes. But if I’m feeling particularly adventurous, I’ll throw on an eclectic mix of Liberty prints, stripes, tweeds or plaids and finish it off with a cameo piece or three. See a curated selection of vintage cameo jewelry at my portfolio site CynthiaRybakoff.com. 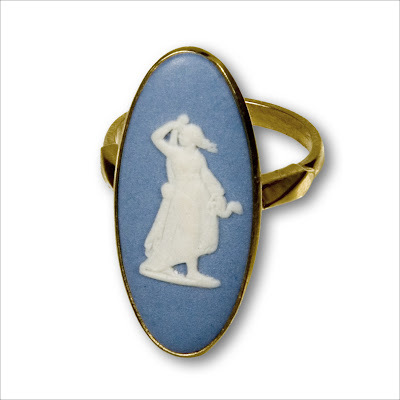 Cynthia Rybakoff vintage French blue cameo ring, size 6 1/2, with modern 24k vermeil finish, edition 1/1 $255, by request at CynthiaRybakoff.com. A piece of black jewelry is an essential item to own and wear year round, regardless of color and which of the seven biomes you reside. The colors you wear reflect your character and how you feel. Color should be a personal choice – what looks best with your hair color and skin tone. Black is the most functional color. It works well for everyone in any context. It can be conservative, classic, somber or edgy. Black is the color I am favoring right now, mainly because I am overloaded on the rainbow palette in fashion and design that has been so prevalent lately. In the past couple of years I have acquired many brightly colored things including tangerine herringbone and cerulean wool jackets from J. Crew, a pair of West Elm canary yellow lacquer candlesticks and a Coach suede shoulder bag in the brightest green imaginable. Fortunately, I own lots of unique black items that are timeless, like my Ralph by Ralph Lauren black goatskin fitted blazer from the late 90’s, my Fratelli Rossetti slim black leather riding boots with black leather pick stitching and my prized 1960’s Hermes black crocodile Piano Bag to name just a few. This year, at home, I plan to add touches of black to our beige and white environment. Vintage items like carved picture frames with worn black paint and cloche jars on chipped black wood bases are desirable. Raw linen pillows with black graphic arabesques patterns will really pop in our small studio, and hardware in oil-rubbed bronze would break the monotony of chrome everything. I design and wear a lot of black jewelry, highlights of which are currently featured on my portfolio site. The pieces I am wearing the most are my EveryDay small black diamonds studs set in a wide gold bezel, a sculptural black opal freeform necklace that adds a little drama to any outfit, and assorted Wedgwood black basalt Jasperware cameo pendants I wear two at a time. 1. Wedgwood black basalt Jasperware cameos are in a word stunningly graphic. The stark black and white silhouettes and the matte stoneware surface is what attracts me most. 2. Black opal is as glorious as the night sky, twinkling and shimmering with tiny flecks specks of ruby red, emerald green and sapphire blue. 3. 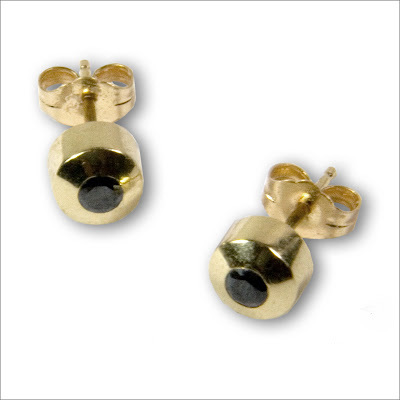 The sponge-like matte black surface texture of black lava beads are a wonderful contrast to shiny rich karat gold. 4. Jewelry made from wenge wood is something I used to craft myself, when I had a studio with a wood shop on 29th Street in the early 90's. Especially popular were hand carved wenge wood rings, of which no two were ever alike. 5. Hyperstein is an inexpensive but fabulous silvery opalescent stone with black striations running through it like tiger stripes. 6. 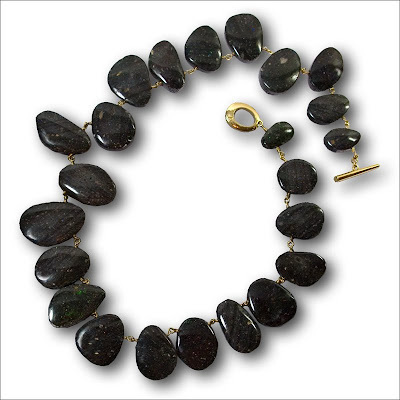 Black Tourmaline gets its darker color from iron and occurs in triangular prism-like crystals that can be sliced into rough organic looking beads. 7. Jet as a gem material was highly popular during the reign of Queen Victoria, during which the Queen wore Whitby jet as part of her mourning dress. Jet is not a true mineral, and is derived from decaying wood under extreme pressure. 8. Black drusy, a mineral like onyx or hematite that is naturally covered with tiny sparkling crystals, is my preference over pave crystal. Don’t get me wrong, because I spent years gluing Swarovski crystals to my fake fabulous jewels in the late 80’s and early 90’s. I think I just inhaled too much epoxy. 9. Tahitian and black peacock freshwater cultured pearls are my favorite in the the pearl family. 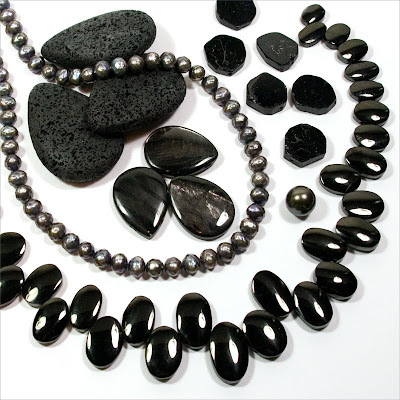 I spend hours choosing black pearls with smooth, unblemished surfaces that shine brightly in the perfect range of iridescent charcoal, olive, plum and teal. Cynthia Rybakoff 18k gold and black opal free-form necklace, $1,690; 18k gold and black diamond studs, $950, by request at CynthiaRybakoff.com.